Take a dip at the beach without braving the waves. Cornwall’s pretty tide pools and lidos are ideal for kids and less confident swimmers. Fancy a spot of wild swimming that’s more, er, well tame? Shielded from the dangers of the open ocean current and crashing waves, tide pools are ideal for families and those slightly less adventurous. Spurred on by the gorgeous weather we’ve just had (I have a proper British tan to prove it), here’s my round up of my favourite places to cool off. Always remember kids – check the tides though or you might not find some of these at all. I’ve been so excited about the reopening of this pool, I’ve watched progress and joined in the fund raising. Now £3 mill more beautiful, the pool reopened in all its Art Deco restored gorgeousness bank holiday weekend. No less than 2,000 swimmer splashed about on open day. 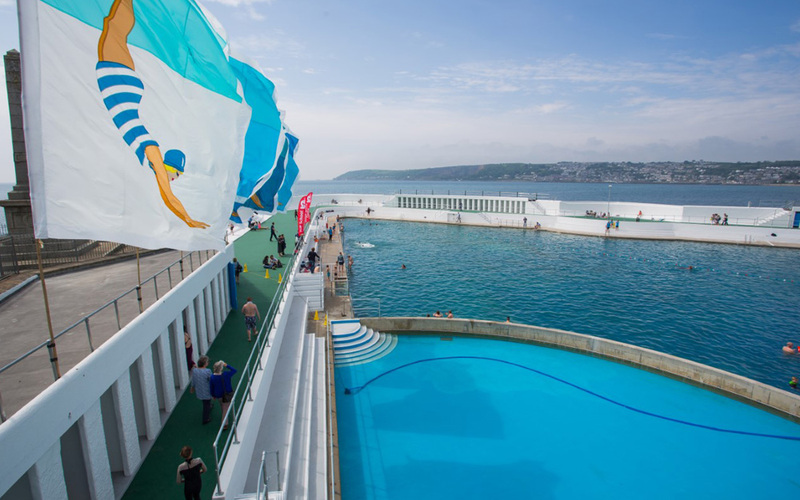 The triangular lido is re-filled with water only during the highest of spring tides and offers impressive views out across Mounts Bay. It’s being managed by Tempus Leisure. Family annual passes available for £175. The official opening is scheduled for 18 July – more on that in a few months. Good for: families – this pool is has a kiddy pool bit down one end shallow enough for little ones and reassuringly has life guards. There’s a cafe on site too. If you’re part of the PZ massive, you can enjoy a residents discount. Parking: if you’re early enough, you can park on the prom. If not, there’s ample parking on the South harbour. The pool is just a 10 minute walk from Penzance train station though, so why not make an adventure of it and leave the car at home. Open: 10am – 6pm 28 May – 11 Sept 2016. 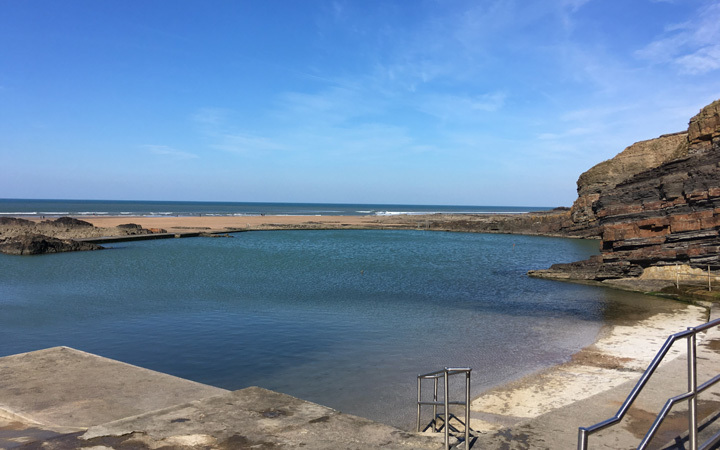 Popular with tourists, locals and the Muddy kids (its right on Summerleaze Beach, and only a 5 minute flat walk from town) Bude sea pool is a huge lido, part man made, part natural. Its so popular, someone voted it best Family Attraction in the Muddy Awards recently! The pool its topped up twice daily by the old man of the sea. Deep enough for jumping in with shallower areas for little ones the pool provides safe swimming conditions for everyone. Watch out for: Crowds! Due to access and location this is a very popular spot in the summer. Parking: Parking is available right on the beach. Mr MC took us off on one of his legendary jaunts to find Chapel Pool in January. Yes January. I’m keen, but not that keen. This tidal pool in Polperro has been used for generations by Cornish families. Accessible at half tide, it warms up nicely to bath like temperatures due to its south facing aspect. Perfect for a summer paddle. Good for: Families. Snorkelling. During the summer, you can take a horse and cart ride from the carpark which is a much more civilised way to travel. Watch out for: At high tide the pool is totally covered – so plan ahead and check the tide times. Access is tricky – prepare yourself for a lot of steps. The walk from the carpark is a really long one. Willy Wilcox’ ghost! The caves are a reputed smuggling area. Parking: There’s a main carpark on the outskirts of Polperro village, but its pricey, and a good walk from the beach, but unavoidable. Open: All year, but do check the tides, and frankly, you’d be nuts to go in the depths of December. Late summer is best as that’s when its warmest. Off the radar for most tourist trails, but just south of Cape Cornwall, Priest’s cove is well worth a visit with little ones. This is a small lido, carved out of the rocks. Watch out for: Its a fairish walk from the car park, so younger children might complain. Access isn’t level either. No lifeguard action. Parking: There’s a designated National Trust car park in Cape Cornwall. Follow the way markers and take the footpath down the slipway and on to the beach. Open: All year, but tide dependent. Again, call me a softy but this is a summer thing. Portreath is not just for surfing you know. To the right of the beach, up against the harbour wall is a cute little tidal pool, and to the left you’ll find six even smaller bath-shaped pools that were carved out for Lady Frances Bassett during the 19th century (sounds a bit Veruca Salt if you ask me). One of the baths is hidden inside a cave and accessable via a ladder – how exciting is that? Good for: adventurers, cave swimmers. Parking: Park in the car park overlooking the beach or find a free space on the side of the road. Open: Not managed by anyone, so whenever the fancy takes you. The swell can be tricky and care should be taken at all times.